Microsoft knows a good thing when it sees it. And what Google has going on with its search advertising business is a good thing — which, of course, is why Microsoft want a bigger piece of it. 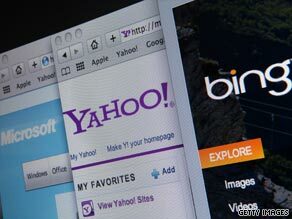 To that end, it struck a deal yesterday to power the searches on Yahoo’s various properties. The deal will increase the market share of Microsoft’s search platform, Bing. The boost will help. In June, according to estimates from comScore, Microsoft’s share in the U.S. search engine market was 8.4 percent, and Yahoo’s was 19.6 percent, compared to 65 percent for Google. So Bing will soon have close to a 30% market share, making it a stronger alternative to Google, and Microsoft will move closer to enjoying the “self-reinforcing, positive feedback loop” that has powered Google’s rise to dominance. Watch more on search engines » That loop, as described by Gartner analyst Neil MacDonald, is essentially what the software giant is after. It works like this: the more people use the search service, the more advertisers are willing to pay because more people are using it. And the more paying advertisers there are using the service, the better and more relevant the ads that come up. Plus, the more the search engine is used, the better it becomes, thanks to contextual learning algorithms. As for Yahoo, its stock took a hit after the announcement and many observers predicted the deal was the beginning of the end for the firm. Jason Calacanis, CEO of the human-powered search engine Mahalo, wrote a blog posting entitled “Yahoo committed seppuku today.” “The once proud warrior of the Internet space laid down its sword, knelt at the feet of Microsoft and gutted itself today,” wrote Calacanis. But not everyone sees it that way. MacDonald sees a “very focused, smart deal” on both sides. Yahoo CEO Carol Bartz was astute, he says, in realizing that the company was about a “collection of media properties and the experience the user has,” and that “you don’t have to own search to make that experience compelling.” Yahoo will not receive an up front payment from Microsoft as part of the deal. Instead, it will receive 88 percent of search revenue generated via its sites during the first five years of agreement, according to yesterday’s announcement. The company estimates that the agreement will add about $275 million annually to its operating cash flow and that it will be able to save about $200 million by basically outsourcing search. Search data will be shared between the two companies. They will continue to compete in other areas, including email, instant messaging, and display advertising (“coopetition” like this is fairly common in both media and technology fields, notes MacDonald). Google isn’t sitting still while Microsoft moves in on its territory. It’s working on a Chrome OS slated to come out later next year that will compete with Microsoft’s Windows, and its suite of online applications already puts up a fight against the Office juggernaut. Of course that’s a feeble fight at the moment, but then so is Microsoft’s fight in the search arena. One or both of these fights might become less lopsided over time, but we’ll have to wait and see. For now Google and Microsoft have seemingly insurmountable leads in their respective strongholds. Not addressed in the deal is the challenge presented by the growth of real-time search — Twitter being a perfect example — which can make both Google and Bing look downright outdated in certain cases. For instance by typing #Bing into Twitter you can see what people around the world have been saying and sharing about this deal in the past 5 seconds. Meanwhile the ever growing juggernaut of Facebook also challenges the central place held by Google — and by Bing, if Microsoft has its way. These search engines use impersonal algorithms to draw an atlas of the Web, but Facebook wants users to get their information about the world through their filter of friends and colleagues — just as in real life. When a Facebook user taps his or her “social graph” to find the best dentist, they never leave the world of Facebook — and Google are Bing left out in the cold. And Facebook has far more details on its users, who use their real names. Microsoft, at least, is an investor in Facebook, thanks to a deal struck a few years ago. Google, much to its chagrin, is not. But it is, clearly, right in Microsoft’s sights. Microsoft’s Kumo: already a step behind?